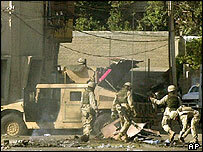 Iraqi and US troops have been involved in renewed clashes with insurgents in several areas of the capital, Baghdad. At least three policemen died when the rebels fired rocket-propelled grenades at their station in the Adhamiya area. An adviser to an Iraqi minister was killed in a separate attack, along with three other people. A US soldier also died, and nine others were injured, when their unit came under a co-ordinated attack, the US military said in a statement. Many observers believe the attack on the police station was in retaliation for Friday's raid by Iraqi security forces, backed by American troops, on the Abu Hanifa mosque in the same district. Two worshippers were killed in the attack on one of the most important Sunni mosques in Iraq. The troops were searching for militants who had fled from Falluja, where a US assault was still continuing, despite earlier US statements that the offensive had "broken the back of the insurgency". The insurgent attack on the Adhimiya police station began early in the morning with rocket-propelled grenades and small arms fire. Eyewitnesses said they heard gunfire and explosions and saw thick columns of smoke rising above the area. US tanks and helicopters went to help the Iraqi security forces in the three-hour battle near the Abu Hanifa mosque. The police compound was badly damaged by bullet holes. A little later, gunmen assassinated Amal Abdel-Hamid al-Maamalji - adviser to the minister of public works. A spokesman said the gunmen had blocked Maamalji's car as she drove to work and opened fire, killing her and her driver, secretary and a security guard. The attacks on the US unit in an unidentified part of Baghdad included improvised explosive devices, small-arms fire and rocket-propelled grenades, the military said. The US-led assault on the Sunni Muslim city of Falluja, 50km (30 miles) west of the capital, Baghdad, is aimed at stabilising the country before the elections. Lt Gen Lance Smith Gen Smith, the deputy head of US Central Command in Iraq, said polling was likely to take place on 27 January and the signs were that Iraqis were looking forward to voting, despite the threat of violence. However, he said the "widespread campaign of intimidation" by insurgents would be hard to bring under control before the vote took place. Gen Smith said US commanders could boost troop strength in Iraq ahead of the elections by about a brigade - in other words, by 3,000 to 5,000. US forces in Falluja continue to fight what commanders describe as the last pockets of insurgent fighters hiding in the south of the city. Artillery, tank shells and bombs fell on the area for much of the night and the boom of artillery fire continued into Saturday morning. The marine commander says these are the final bands of fighters in Falluja but they are proving difficult to dislodge. The US military officers say they hope to have the fighters cleared out by the end of the weekend.